Safety is a top priority at Cameron LNG. The terminal meets and, in some cases, exceeds all industry safety requirements. Sophisticated alarms and multiple back-up safety systems, which include emergency shutdown (ESD) systems, are core components of the Cameron LNG facility. 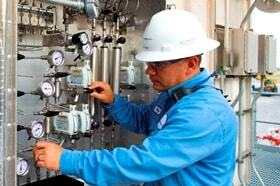 ESD systems can identify problems and shut down operations, limiting the amount of LNG that could be released. These systems are linked to automatic gas, liquid and fire detection equipment. There are also detectors for monitoring LNG levels and vapor pressures within storage tanks and closed-circuit television equipment for monitoring all critical locations of the LNG facility. LNG terminal safety systems combined with special operating procedures, training and equipment maintenance minimize the risk of an accident. Cameron LNG regas terminal employees reached an important safety milestone in 2016 – one million (1,000,000) man-hours and 10 years without a single lost-time incident.